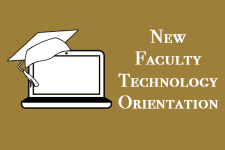 The Instructional Technology Group offers new faculty members opportunities for a technology orientation. Come meet us and get a 30,000 foot overview of technology the WFU way. Do I really have to change my password every 6 months? Do I need to purchase my own software? We are offering two sessions this summer. Please complete the registration form to claim a spot.